Cargo pants and a denim shirt, re-styled. A little too buttoned up! The day has finally arrived! My kids have left the building and all is peaceful and quiet at my house. Thank God! Today I’m wearing my favorite cargos. They truly are the most comfortable pants I own. But, being olive green, I sometimes find it hard to figure out what to wear with them. I usually stick the the basics- black, white and today blue. I’m showing 2 different looks to compare. On the right I am wearing a buttoned up denim shirt and my comfy Birkenstocks. I look awful- but honestly, this is something I would have worn a month ago. Gasp! 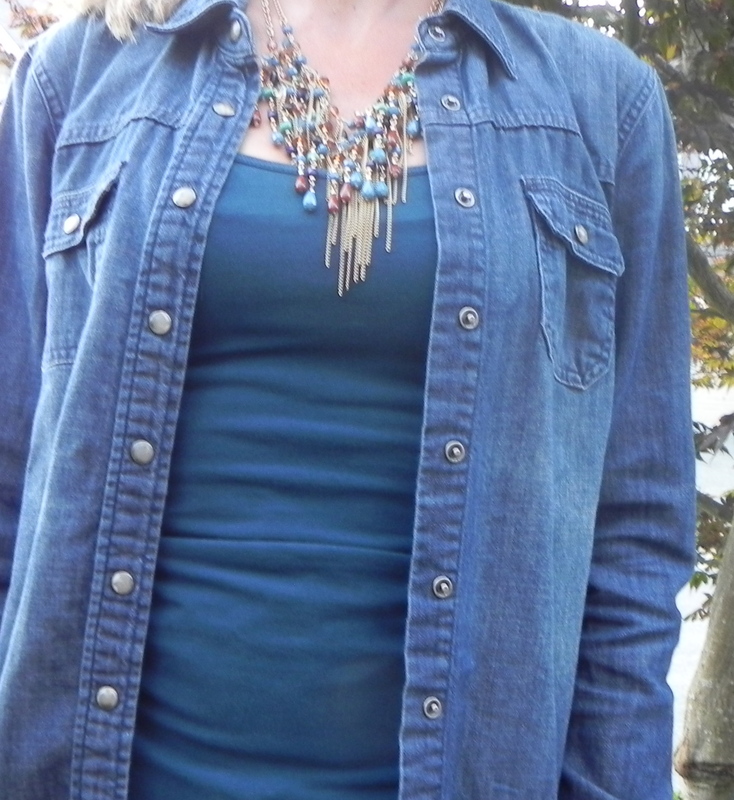 To re-style this look I added a blue tank and unbuttoned the denim shirt and added an interesting necklace from my new favorite jewelry store- Forever 21. I also swapped out my Birks for my cute, comfy and trendy desert booties. I think this is a bit better, don’t you? What do you pair with olive cargos? An interesting necklace can make an outfit complete! 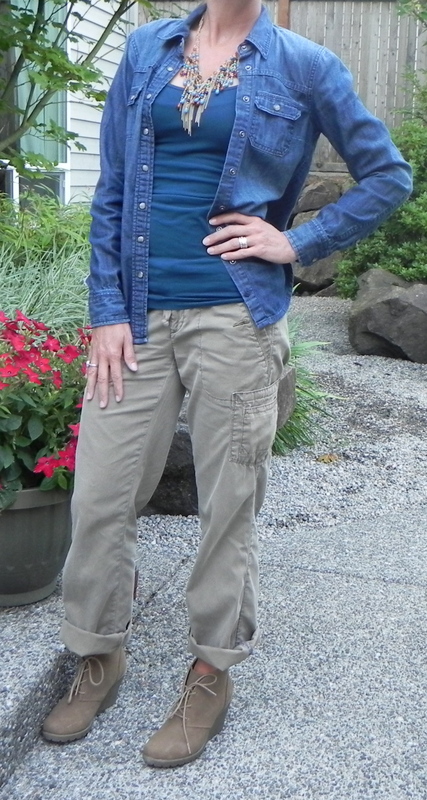 Cargos: Anthropologie, Tank: ?, Denim Shirt: Martin and Osa, Necklace: Forever 21, Booties: Kohl’s. Sadly, yes! The birks have been retired! They are no longer allowed out of the house. I know you will miss them! Thank you so much for your tips! I really struggle with what to wear with my olive pants- they are so comfy (feel like sweat pants), but I never know what to wear on top. I am blond- so I do like the warmer tones- but I also love dark purple and pink- and will definitely try those suggestions. Again, thanks for writing! I’m glad you enjoy my blog- I LOVE doing it!